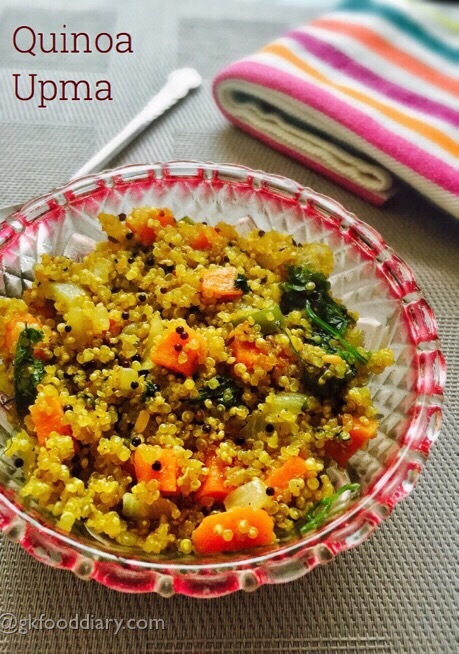 Quinoa Upma- easy and healthy breakfast recipe made with quinoa & vegetables. Its a nice variation to the usual upma varieties and tastes so great. Try yourself to believe it! 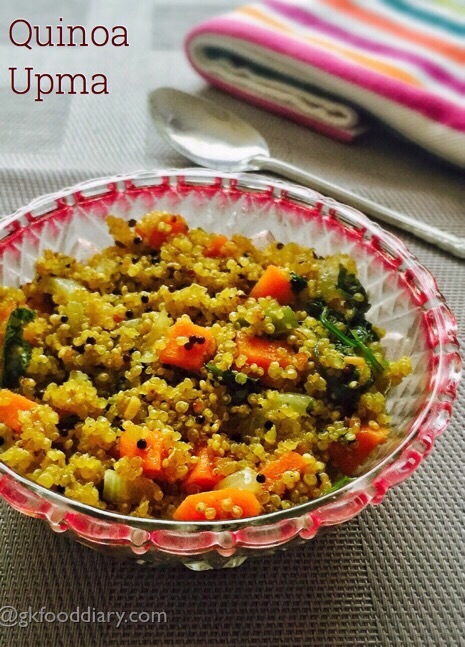 Quinoa upma can be done very quickly and ideal for kids after one year once they started eating all family foods. 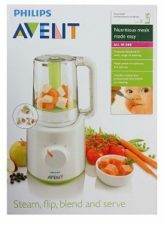 Get more information on introducing and selecting quinoa for babies and kids here. 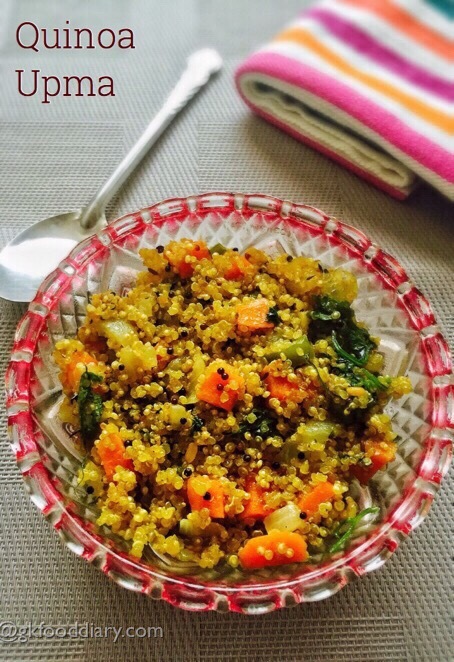 I am planning to post more quinoa recipes as demanded by readers and friends, also I am loving experimenting with quinoa for its versatility, texture and health factor. So stay tuned for more quinoa recipes! 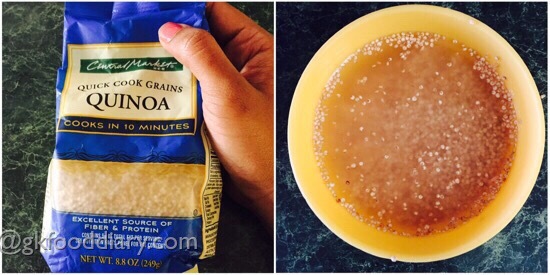 Here is how to make easy and healthy quinoa upma recipe for toddlers and kids. 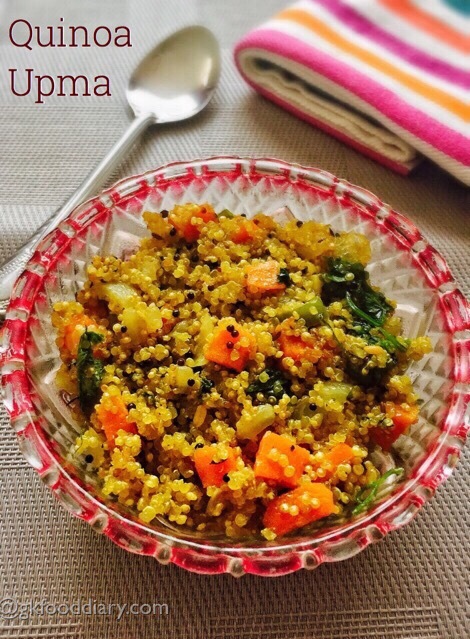 Quinoa Upma - Wholesome breakfast or evening snack made with Quinoa and vegetables. Measure and take the quinoa in a bowl. Wash it thoroughly until the water runs clear. Then Soak it in water for 10 minutes. Set aside. Wash all the vegetables and cut them into small cubes. Set aside. Keep all the other ingredients ready. Chop onions,ginger, green chilies and coriander leaves. 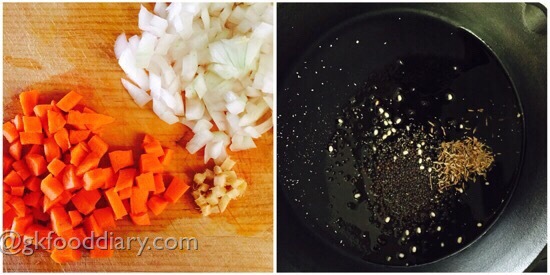 Heat oil in a pan and add the items to temper one by one. Saute until cumin seeds cracks. Now add onions along with green chilies and saute onions until it's transparent.Then add chopped vegetables along with turmeric powder and salt, toss it well. Then add required amount of water and bring it to a boil. 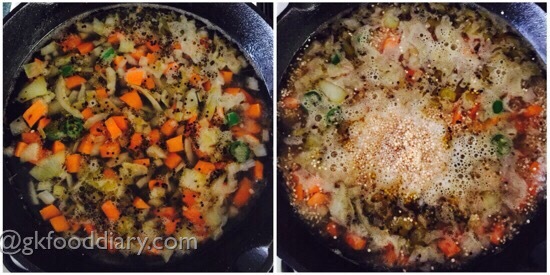 Once the water comes to a rolling boil, add the soaked quinoa after draining the water from it completely. Mix everything together until it comes to a porridge like consistency. 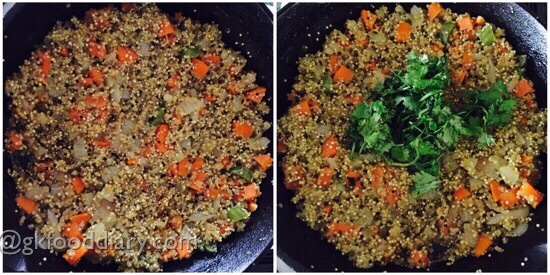 Then cook it covered for 10 minutes or until the quinoa is cooked and vegetables are soft. After 10 minutes, Open the lid and check whether the quinoa is cooked well. Switch off the flame and garnish with coriander leaves. 1. Measure and take the quinoa in a bowl. Wash it thoroughly until the water runs clear. Then Soak it in water for 10 minutes. Set aside. 2. 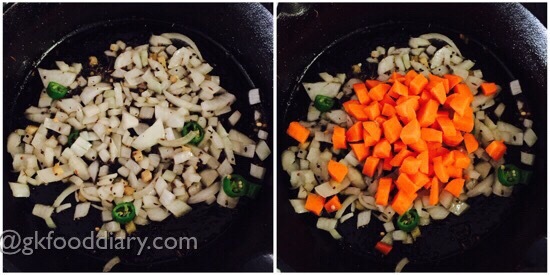 Wash all the vegetables and cut them into small cubes. Set aside. Keep all the other ingredients ready. Chop onions,ginger, green chilies and coriander leaves. Heat oil in a pan and add the items to temper one by one. Saute until cumin seeds cracks. 3. Now add onions along with green chilies and saute onions until it’s transparent.Then add chopped vegetables along with turmeric powder and salt, toss it well. 4. Then add required amount of water and bring it to a boil. Once the water comes to a rolling boil, add the soaked quinoa after draining the water from it completely. Mix everything together until it comes to a porridge like consistency. Then cook it covered for 10 minutes or until the quinoa is cooked and vegetables are soft. 5. After 10 minutes, Open the lid and check whether the quinoa is cooked well. Switch off the flame and garnish with coriander leaves. The healthy quinoa upma is ready! Wash the quinoa thoroughly before soaking. Make sure to squeeze the water completely from quinoa after soaking. You could also add cashews or almonds or nuts powder or roasted Bengal gram dal powder to the quinoa upma. Any seasonal vegetables can be used to make this quinoa upma. Make sure to introduce everything separate to your baby before you try this quinoa upma.